Image Size: 24"w x 12"h.
The Raider’s carrier task force (TF-16) was spotted by Japanese vessels well before they arrived at the intended departure point so the Raiders were forced to launch from the carrier "Hornet" earlier than planned. Fuel calculations now fell short of the planned amount needed for their destination, Chuchow, China. Their arrival in China would be at night, rather than during daylight as originally planned. Fortunately, sailors on the "Hornet" filled ten, five-gallon gas cans and passed them hand-to-hand to each aircraft, providing the fuel that made the difference between pitching at sea and coming down over land. In this historical documentation on the Doolittle Raid, General Doolittle and his crew in aircraft 02344 break into a momentary area of clear sky. The last rays of sunlight bring only slight hope that they will survive their ordeal, as their fuel levels continue to fall and the hour of landfall is uncertain. "Fuel State Critical—Outcome in Doubt" is countered-signed by four of the Doolittle Raiders. The signing of the print took place at their April 2010 reunion in Dayton, OH. They included the Crew 1 co-pilot of Doolittle’s plane (the B-25 depicted here), Colonel Richard E. Cole, Lt. Colonel Robert L. Hite of Crew 16, Major Thomas Carson Griffin of Crew 9 and Staff Sergeant David J. Thatcher of Crew 7. Phillips’ Personal Commission Edition of the previous Raiders Fine Art Edition, "Toward a Setting Sun," reached an edition size of 298. Given that there are only 100 in the edition of "Fuel State Critical—Outcome in Doubt," this piece of history won’t last long! Phillips grew up loving art but never thought he could make it his livelihood. At college he majored in criminology and had been accepted into law school when four of his paintings were sold at an airport restaurant. That was all the incentive he needed to begin his work as a fine art painter. Bill Phillips is now a renowned aviation artist and the landscape artist of choice for many collectors. Bill's strengths as a landscape painter, a respect and reverence for a time and place, help him when painting aviation as well as classic landscapes. Phillips often spends days observing landscape subjects. Finding companionship with the land, he is able to convey the boundlessness of nature on the painted canvas inspiring a reverence for the natural landscape in its beholders. After one of his paintings was presented to King Hussein of Jordan, Phillips was commissioned by the Royal Jordanian Air Force. He developed sixteen major paintings, many of which now hang in the Royal Jordanian Air Force Museum in Amman. The Smithsonian Institution’s National Air and Space Museum presented a one-man show of Phillips’ work in 1986. He is one of only a few artists to have been so honored. In 1988, Phillips was chosen to be a U.S. Navy combat artist. For his outstanding work, the artist was awarded the Navy’s Meritorious Public Service Award and the Air Force Sergeants Association’s Americanism Medal. At the prestigious annual fund raiser for the National Park Service, Bill’s work has been included in the Top 100 each year he has entered the competition and his work has won the Art History Award twice. Phillips was selected as the Fall 2004 Artist in Residence at the North Rim of the Grand Canyon and tapped by the U.S. 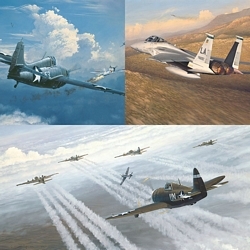 Postal Service to paint the stamp illustrations and header design for a pane of twenty stamps in 1997 entitled Classic American Aircraft. He was chosen again in 2005 for a pane of twenty stamps (ten designs) entitled American Advances in Aviation. Bill’s major collection of aviation art, Into the Sunlit Splendor, was published by The Greenwich Workshop Press in 2005.